Virginia Tech's annual financial report filed to the NCAA this month shows the athletic department operating with a surplus of $4.8 million. It's the first time since 2014-15 the department generated a surplus. The department had a $3.2 million deficit last year. Is anyone else surprised by this good problem to have? Thoughts on what Whit is potentially stashing the money away in the bank for? 4.8-3.2= 1.6, which isn't that much of a surplus for a department that goes through over 90 a year. So I wouldn't assume that it's a big stash. I mean, even $500k would provide Fuente a much larger pool of assistant coaches to target. And, shivers, no staff changes are made, that's more support staff. To your original point, money in the bank is missing from the equation. It would be interesting to know how much debt or outstanding bills Tech had. VT appears to run a pretty tight ship from an accounting perspective. It's something they've always seemed to do pretty well. But I'm all for a bigger investment in football support staff (or assistants) if they can afford it. I suppose it depends on how we envision finances. For the most part a lot fo businesses consider "money in the bank" to be a type of "end game". To grow and operate you mostly need net positive cash flow. It was a hard lesson I had to learn in terms of how I viewed our status. Having said that, I love "money in the bank". Disagree. Most business want to leverage themselves to continue to grow. Money in the bank isn't doing anything for us. A 1.5 million surplus over two years in a 95 million dollar a year business isn't really a game-changer, particularly when it comes from donations. And nobody here even knows the actual numbers. I'm going to trust Whit on this one, particularly with the variability from year to year. But I'm all for putting more of it towards football if it's possible. It's not so much that I trust Whit unwaveringly, as that he's had a positive impact across VT sports. Football and basketball haven't arrived yet, but they're in a better place than he found them. Frankly, I get tired of the nonstop negativity. Remember, it's not the critic who counts, it's the actual doer of deeds. $1.5 million absolutely isn't a game changer in college football. There is more variation than that between individual year budgets. What if there's a down year because of the tax changes? Are you going to fire the staff you hired with every last penny? Yes, I'm going to trust Whit to know how much of the surplus he can spend. He knows a lot more about the VT athletic budget than anyone here. The fact is that we can't even have an informed opinion, as we don't know the details, only the gross number as reported. Somehow, having a surplus comes across as a negative to some people. It's a big surplus when the majority of collegiate athletic departments operate in the red. Well, it does show that Whit knows how to run an athletic department. $4.8M is a pretty big surplus if you don't factor in the loss from last year. Would need a lot more analysis and some knowledge of the future budgets to know just how big it really is. That kind of money comes with a lot of accounting possibilities. I gotta agree with this. You just look at what Saban does at Alabama. They have just a high rate of coach turnover as seniors leaving their program. Yet it doesn't affect them in the slightest. Saban is always adding new staff positions and coaches. Granted we don't have that money but I think it goes to show how much a large support staff can help. Absolutely. And it all comes together when the head man has an innate ability to identify coaches he can plug directly to his staff/system once the inevitable departures happen. You mean Saban doesn't just hire his friends from 5 years ago? We are saving money for a "Major Cassell Renovation" by 2022. Whit said as much in 2017. More of both kinds! Ones hanging from the roof and other kind sitting in the seats! I wouldn't draw that conclusion. Given how he's operated In the past, a project like that screams sponsorship or one-time donation to cover major costs. And if not, meh, I'd rather it pumped into football. Part of that has to be going to pay back the university for the loan to build the TV studio in Lane. Wouldn't that already be covered in their expenditures? The last article I read said the school loaned the athletic dept the money but there wasn't a payoff schedule set yet. Do you have a link for that? Without seeing any financial statements, I'm not sure how you can speculate on this. On a P/L, a loan would likely be captured in 'other income and expenses.' Since this isn't a true P/L, they may not even be recognizing the loan as part of 'AD Revenue.' They may be including it in 'Expenditures' though. Yea I'll try and find it later. I'd love to see a detailed breakdown of our recruiting budget. As a fan, it feels like our biggest (football) need is recruiting, but I'm not sure where specifically. Staff? Travel expenses? Something else? Look for expanded beer and wine sales at Lane this fall with the less than mediocre home schedule. Go Whit! The new baseball field lucked into having the opportunity to serve all fans. It provided a good test with the football club seats. It was originally only supposed to be for the club area at the baseball field, but when they met with the BOV to approve it, for some reason the BOB thought it was for the entire stadium, so they just went with it. Stashing money for new stadium that doubles the intensity of Lane. 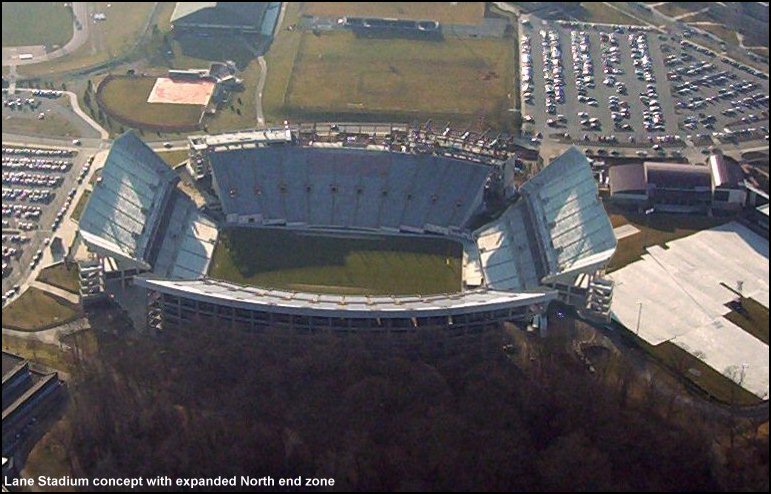 True TerrorDome status...120,000 seats that puts Blacksburg on the richter scale every home game. like the photoshop but unfortunately that stadium would be half empty every game and would only send shockwaves through VT's balance book. I know it's a pipe dream but hopefully we can get there one day where it is completely full. Not even then. Alabama's stadium upgrade includes reducing capacity. 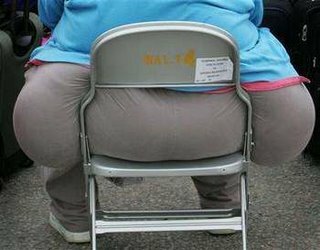 Clemson might sell tickets to every game but people aren't filling the stadium for every game especially on the "hill" for student seating. I like that, too, and it should come with a sponsor. Going on a tangent now but whatever... 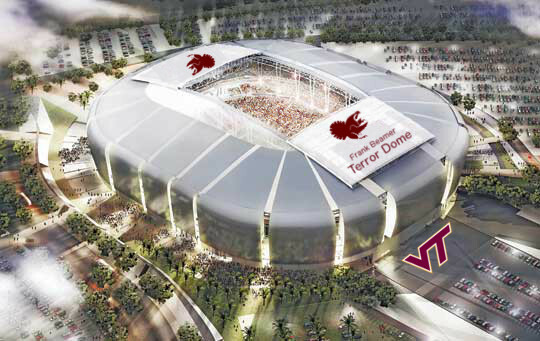 I think I would have liked VT to connect the South Endzone like this but have the upper part of South Endzone cut in half. I don't think we can connect, else we would have to bring the East and West stands up to current fire codes, which I believe I read would be cost prohibitive. Its why we didn't bowl in the SEZ back in 2002. I'd much rather just expand the bleachers in the NEZ and contain all students there.